It's one of the greatest conundrums facing an automaker today: Should a hamster hawking a B-segment Korean sedan be fit or fat? 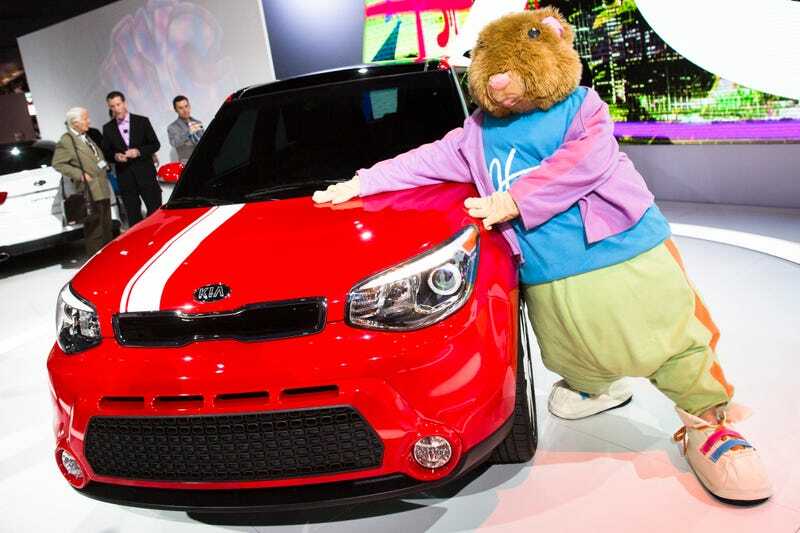 I'm going to go all out and say that the Kia Soul hamsters are the most recognizable of all automotive advertising today. Yes, even more than Imported From Detroit. It's one of those commercials that if your grandmother recognizes it and the product they're selling, then it's a hit. Kia knows this (though I hate when they throw around terms like "legendary" and "iconic"), but now they're trying to figure out what to do with the hamsters now that they're on a diet. The first few hamster ads had fat hamsters. Then they hit the gym with Lady Gaga and got skinny. On YouTube the comments are very favorable toward the slimmed-down hamsters. Really cool. On our Facebook page, the Soul Facebook page, it’s split. There are a lot of people that really like the hamsters in their original form. So, from a social media standpoint, it opens up a great debate: which direction should the brand go in the future? Do the hamsters fall off the diet and exercise routine, and go back to their (heftier former selves) or continue down this path of exercise? These poor hamsters. Body-shamed to keep up with the pressures of society! Just kidding. Yeesh, this really is a tough choice. Health groups will certainly attack Kia if they go back to being plump, but they might get attacked anyway by organizations that promote healthy body image regardless of size. I'd say just go ahead and keep them skinny, make a few more commercials and quietly send these hamsters off into the sunset. Or just take my idea and start using more humans in Soul advertising.